Gail's posting on Wildflowers on the fourth Wednesday of the month is always an educational experience for me. I don't always get to participate (nor do I get the posts done on Wednesday) but I do like to read through the posts. Where I live is so untamed, knowing what are wildflowers and what are invasives is good knowledge as I walk around my yard. Two of my offerings today have been talked about before and one is a mystery vine. Let me start with one of my favorite finds from my woods. This is Crane-fly Orchid or Tipularia discolor, a lovely little native that has foliage in the winter which disappears during the summer. I have posted its leaves before- here and here and the blooms here. The challenge is to remember where the leaves were during the winter. I put sticks in the ground, surrounding the area. After three years, I probably don't need the sticks anymore, I KNOW where these babies are! Photographing the slender stalks with their blooms is not easy. I had just come back from the mailbox when I first saw this year's blooms, so I used the back of an envelope to give a plain backdrop. The exciting part of this year's flower stalks was that there were three stalks. Seems my little plot of Tipularia discolor is growing! Not happy with the white background I came in and got the black apron to give a dark backdrop. Ignore the dog hair. Maybe by next year I will have figured out how to best photograph these tiny orchid blooms. This time of year there are all sorts of blooms opening in the woods and it is always a surprise to find where some pop up. The Spurred Butterfly Pea or Centrosema virginianum is a large purple bloom. It grows on a vine that shows up in various spots through the woods. I have posted about this beauty about four times. Here, here, here and here. Isn't she a beauty? It was a new plant to me when I first moved here, now I feel like she is an old friend. Her delicate vine twists through various shrubs in the woods or across the open ground, she isn't picky. See how large the bloom is? It is big enough to make you stop and look to see what that pretty purple bloom might be. I am including her in this Wildflower Wednesday posting because I have collected a few seed pods. I took an old aluminum pan outside to put under the pod as I clipped it from the vine. Good thing I did that as it acted like a spring that needed to coil. The very dry, ripe pods will pop into a spiral fashion, dispersing the seeds outward. Mother Nature is pretty clever in her ways of spreading seeds. These are long narrow pods.....they are dark brown when they are ripe and almost disappear against the forest. They are native all across the South, as far west as Texas and as far north as New Jersey. You can see the range here....so--- I have enough seeds to share with three of you (maybe more if I can find more seed pods). If you are interested in trying your hand in growing this pretty little vine....tell me in the comments. If there are more than three I will pick three names. And now for our mystery vine. It blooms late -- fully in bloom photos are from October last year, the stem is squared, the leaves are heart-shaped, arranged opposite each other, with new growth also springing from the nodes. I have looked for this on Namethatplant.net and have had no luck. Here it is again this summer, buds plump and soon to open. I have looked for it in all my wildflower books, to no avail. The squared stems seem to be reddish purple this year. Maybe they age to a green color by October. They grow along my shoreline of the lake. In the fall there are lots of little bees enjoying the blooms. Interesting intersection of stems and leaves. Here is the squared stem. Any ideas? It is interspersed with Apios americana, Groundnut, which was the subject of another post a few years ago. When I first saw the vine last year I thought it might be the Groundnut, but no--- something new! If you have any ideas please let me know. Sure would like to identify this one. 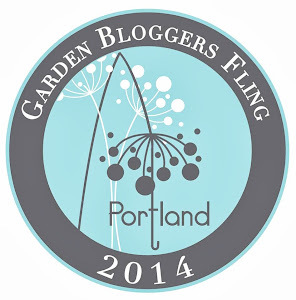 Be sure to stop over to Gail's blog- clayandlimestone.com to see her Wildflowers and others' who have contributed. Tina mentioned she needed a better photo of the leaves--- so here is one more photo of our mystery vine. Well our mystery vine has been IDed! Gail found it. It is Mikania scandens, Climbing Hempweed! No, I am not talking about the soap opera, but the plant material I saw while in California for this year's Garden Bloggers Spring Fling. As previously stated, I was dazzled by all that I saw. Plants that I use as houseplants were growing in the gardens, like skyscrapers, towering over my tiny specimens. The colors are bold, even in the window displays in Chinatown. The blue-green foliage against the orange of the California poppy, Eschscholozia californica jumped out at me....have been trying to grow this in my garden. I had tiny seedlings in multiple places then the monsoons came. Another plant I would love to have in my garden, Abutilon, Flowering Maple, There were some stunning examples of it on our tours. Arbutus, or Strawberry tree was another plant in many of the gardens. Its tiny flowers remind me of Lily of the Valley or Pieris or Blueberry blooms...all in the Ericaceae family. I would love this variety and boldness of color in my garden! If the blooms weren't enough color, some of the garden art will fill the bill! Agapanthus, African Lily or Lily of the Nile was a mainstay in commercial and residential gardens. Here is is in front of the Conservatory of Flowers. While inside the Conservatory there were also some great blooms with intense color. I think Sunset Headquarters took the bold color theme to the highest level. Love this orange trellis, it frames the pathway into a colorful garden. If you have a blank wall, Sunset has an idea of what you can do. Wall art as a planter. Bold is where it is at baby! Leaving the bold and colorful gardens we arrived at Filoli, the estate in Crystal Springs. I included this photo in the bold and beautiful posting because I see so much depth in it. This lovely grove is a grove of olives....the whole walkway seemed to glow in the pale olive color. Beautiful in its richness of color. Also in the Filoli was the Knot Garden. Love the sea of color, even with the bright sunlight the colors popped. Here is that Dianella caerulea in another garden, think the universe is telling me I need to find some for my garden! Another beauty spotted a few places is Melaleuca nesophila or Showy Honey-myrtle-- isn't it lovely? I think even the bark on some of the trees was bold and brightly colored. Think this is a Manzanita or Arctostaphylos 'Ruth Bancroft' at the Ruth Bancroft Garden. I love the curls. Two of the gardens were bright and bold and colorful and full of all sorts of plants that I had no idea what they might be....and I loved being amongst the blooms. The Wave Garden was one of these gardens. This one is Trailing Princess Flower or Centradenia floribunda. I am a fan of hot pink! The Wave Garden had this big and bold collection of Aeonium with other succulents, houseplants gone wild! Of all the color combinations at the Wave Garden, my favorite was this purple bloom, Trachelium caeruleum, against the chartreuse foliage, Banksia spinulosa....wow and double wow! This next bloom looks like striped ribbons threaded through yellow strands of hair. I have no idea what this one is, maybe someone can ID it for me. Noticed in a couple gardens was Kangaroo Paws, Anigozanthos, we saw some yellow ones here and some red ones at another garden. Love the fuzzy blooms. The Nichols garden was bold in their use of living plant material as an arbor. Here, flanked by boldly colored Canna, it beckons you to enter. Keeyla Meadows' Garden was beyond colorful. The plants were colorful, the artwork was colorful, the house was colorful, EVERYTHING was brightly colored. Along the front walk was Clarkia, tall and bright pink (did I mention I like pink?). Great native plant of Western North America. Rose Campion, Lychnis coronaria against the bright blue sky....again pink!! I have seedlings of this plant, hoping one day that it will bloom for me. This little blue bloom is so cute, my sister in law gave me some when we lived in Virginia, not hardy to that zone but I did keep it for a couple years. It is Tweedia caerulea, love the pale blue and the fuzzy leaves and petals. Like I said, there was color everywhere in the garden. Love the color combination of the tiles in the pathway. Yes, this Cuphea cyanea, Pink Cigar Plant, is great, complementing the colors in the hardscapes. I think Cupheas have little faces. Color at every turn, I love this garden. Won't this bench be wonderful to have in your garden? We were able to go inside Keeyla's home and inside was just as vibrant as the outside. I like color and this is incredible. Finally, the bold and beautiful extends to a water treatment plant's grounds, designed by Flora Grubb. The plantings were large statements of color and texture, simple and easy maintenance, a bright spot in the neighborhood. Flora Grubb's Wall-O-Succulents caused many of us to stop and ohh and ahhh. Now this was bold! I saw a succulent wreath a few years ago that I really liked, this totalling took my breath away. This concludes my Fling posts. I hope you enjoyed the way I presented our time in San Francisco. 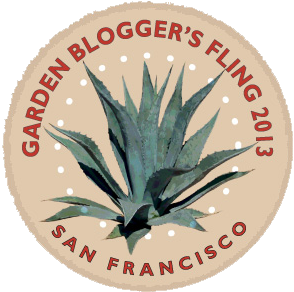 Sometimes these Fling visits are larger than the gardens themselves, it is the overall sense of the location. Did you like reading about the Fling like this? Would you rather have learned about each garden and viewed pictures of the garden in a single post? As I mentioned in the previous posts about my experience in California, I felt like I was gawking at everything that came into view. I was in awe. Some of the views were small, courtyards or hillsides, others were as far as the eye could see. The first garden is Matt Gill's garden, filled with fantastic sculptures that he made in his workshop on the lower level of this property. The backyard backs up to a highway overpass. 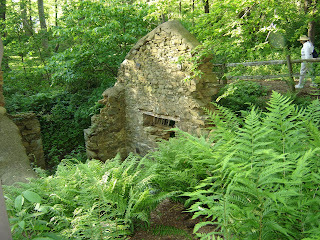 The hillside is filled with amazing plants, holding the soil and rock in place. For those who wondered about the dog bone in the last post, here is another view, along with the highway high above the garden. I love the bone, suspended on a support, in homage to his pet. Large plants created rooms within the courtyard. Small views with a grand feeling. That afternoon we were taken across the water to the Wave Garden. As we walked down the street from where the buses dropped us off I marveled at the gardens. The Wave Garden was so full of color and sculpture and killer views. The Conservancy of Flowers in the San Francisco Botanical Garden was amazing on the inside, but also lent itself to beautiful sunset vistas, glowing in the last rays of the day. The next morning we had views and vistas to think about as Saxon Holt lead a workshop on 'Filling the Frame' in the Botanical Garden. There were some wonderful long views through the gardens and beyond. Many of you know me for all the tree posts over the years I have done. I love seeing tall trees with all their scaffolding -- another great view. Our workshop instruction was to fill the frame and tell a story.....lead the viewer to want more. This curved pathway beckoned one to come further into the garden. There were some long views, all the way to the telecom tower on one of the far off hills. Sunset gardens had more of these grand trees...doesn't this view make you want to climb up into its branches? On the other side of the building from where we had a short presentation on some new plant varieties was an expansive bed of grasses, hiding a covered patio in the shade. Filoli, the country estate we visited, was out in Woodside, CA. The estate was built in the early 1900's and its name comes from the owner, Mr. William Bowers Bourn's favorite credo- "Fight for a just cause; Love your fellow man; Live a good life". Money came from gold mining and Spring Valley Water, the estate is on the southern end of Crystal Springs Lake. It certainly had the long views. In some respects it reminded me of the Biltmore with grand gardens. I chose not to go into the house and fill my time in the gardens. Some of the Fling attendees did go inside and have posted about it. You can find the link to more posts here. Rebecca Sweet's garden had some quiet spaces, this one in the front yard. Love the view into the cool green shade. After you go through the gate to get into her backyard, you are welcomed with the bold color of a Bougainvillea and lush beds leading you to the back of the garden and her workshop. Small courtyards in the front yard of the next garden lent themselves for some smaller vistas. Testa-Vought Gardens were a welcome spot on this hot day. Their views from the covered patio were of a bocce ball court and an inviting swimming pool. Just looking at the water made me feel cooler...or was it some watermelon served by the homeowners? Wonderful! The next morning was incredibly hot, seemed fitting as we were in Ruth Bancroft's Garden of desert plant material and sculptures. Cactus with a backdrop of flowering shrubs and bold colored artwork made for some lively views. One of the docents wanted to make sure we had this view...he called it Longhorn Cattle Cactus. Not sure of the correct name but the 'horns' were shaped like a TX longhorn. We lunched at our next stop, Dudan's gardens. I felt as though we were on top of the world. We ate under the shade of a grand tree on a stone wall. What an inviting setting. Views as far as the eye could see. The house and garden were on the top of a knoll, or a mountain, or a hill, not sure what to call it, but the views were 360 degrees. Literally on top of the world. Under the tree was a small pond, inviting dragonflies and hummingbirds to swoop and dart around us. How would you like this to be your view out your kitchen window? 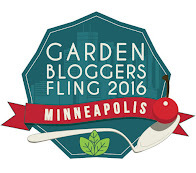 Ok, minus the Garden Bloggers. The Nichols garden wasn't large but again, one packed full of color and interesting plant material...and views. Their home is on a sloped lot and every inch was planted. So many of the plants were so large, yet they seemed to be perfect for the space they inhabited. The garden of Keeyla Meadows was filled with interesting views, usually with one of her pieces of artwork as the focal point. The day was so bright, photographing it well was hard. Views, vistas, focal points-- a vital part of these gorgeous gardens. Views framed by plant material or focal points with sculptures were great lessons in design and significantly added to my experience in San Francisco. Stay tuned for the final posting on bold color! !